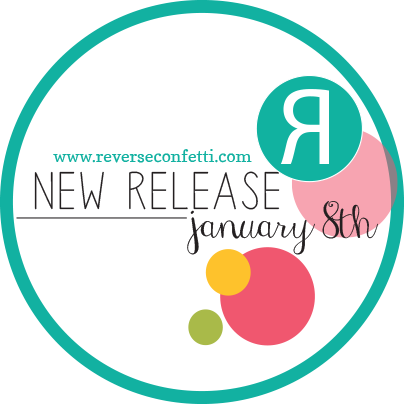 Hey, 'Fetti Fans, welcome to Day 1 of the January Release for Reverse Confetti! This is such a fabulous release, with six new stamp sets and eight new Confetti Cuts! 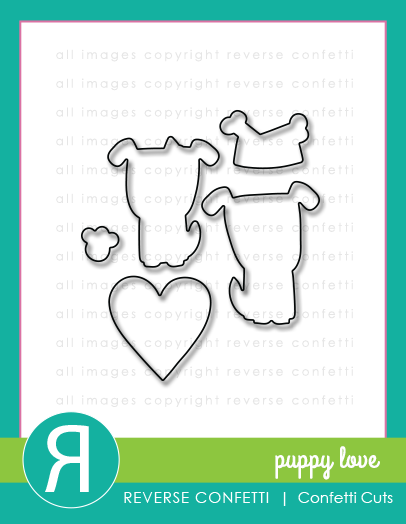 an adorable new set called Puppy Love & a wonderfully fun "heart-themed" set called Heart to Heart. And, they both come with coordinating Confetti Cuts! First up, here are two cards that I made using Puppy Love. Straight Stripes & Big Chevrons. that I diecut from pure poppy and aqua mist card-stock. I stamped the sentiment (also from Puppy Love) onto a strip of aqua mist cardstock and diecut the ends with the smaller tag from Tag Me and adhered it over the seam. to create a background for the puppy stamp/diecut. I watercoloured the puppy once again. with the heart that's included in the Puppy Love Confetti Cuts. Next up are two cards that I made using Heart to Heart. These Quick Card Panels are a limited edition. You get eight different panels that are so perfectly designed for Valentine's Day. also work to use in a pocket-type album. and three Heart to Heart Confetti Cuts at the top, two of which I stamped using the coordinating Heart to Heart stamps. On my next card, I had some fun diecutting my front panel using the Heart to Heart Confetti Cuts. 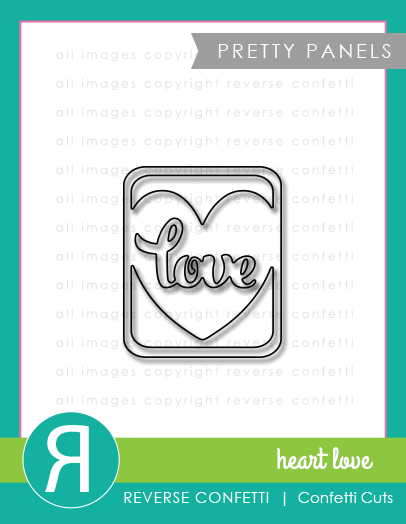 I stamped the "love" using one of the stamps from Heart to Heart. A few sparkling clear sequins from Pretty Pink Posh finish it off. 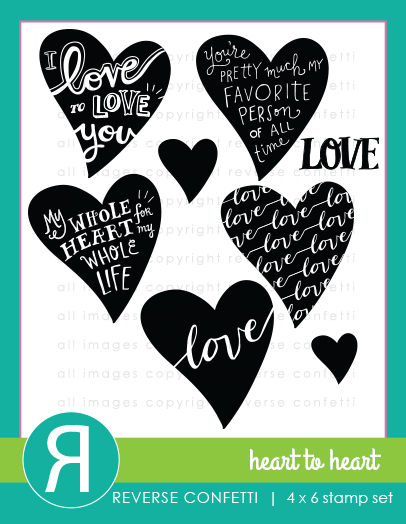 And, lastly, I have one more card to share, using the third Pretty Panel Confetti Cut that's being released this month: Heart Love. I started my inking my cardstock panel using sweet blush, hibiscus burst and raspberry fizz ink. Then I diecut my Pretty Panel: Heart Love from it and removed it. them in the spot that the diecut was in and then adhered the inked diecut over top. Thanks to all of you who left comments.... and to my new followers! "Happy New Year to you Leigh and your family! Looking forward to another creative and inspired year for all of us :)"
And thanks again to everyone who participated in the hop -- so fun! A fabulous set of cards Leigh. I love the gradient inking! So Very Sweet :) Love it all!!! WOW! Great cards, Leigh! LOVE, LOVE, LOVE the last one! Leigh, you're amazing. Love each and every one of your gorgeous projects! The aqua and red color combo makes me a happy crafter. Oh my!!! This is one jam packed source of inspiration!! Well done! Fantastic cards, Leigh! I especially love the one with the big chevron negative pieces! The sponging on the heart love panel is really cool, too. They're ALL gorgeous! Leigh you knocked this out of the park, so many fabulous cards! Love the sponging! Love the negative die cut card with that one red heart! Awesome Leigh! Love these, Leigh! The chevron pieces are AWESOME! I'm a new follower to your blog from the seasons giving post. I love your all white card with the little pop of of red and the ombré effect card. I'd love to learn how to blend like that, I'm going to have to practice I guess, lol. Thanks for sharing. Sensational raw of cards, love them all and I specially love that sweet creation of sponging heart panel! Fabulous new products! I love your card creations! I LOVE your adorable love card in the pinks! What a pretty pop of color! Sweetness to the max, Leigh! A selection of smile-making, day-brightening cards! Again, you and RC = recipe for awesome! Wow! Wonderful cards! 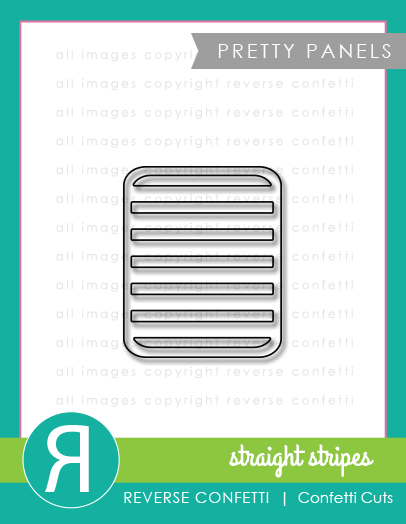 Love them all and especially the use of the negative chevron stripes!! LOVE it all!!! LOVE how you extended the Pretty Panels! What a great set of cards - I can't pick a favorite 'cause I love them all.The Pretty Panels work so well as layers. Great job!! Love how you did the backgrounds on all of your cards. pawsitively full of personality! Darling cards Leigh! Love the puppies. They look so cute layered on the cutouts. Love all your cards, Leigh! 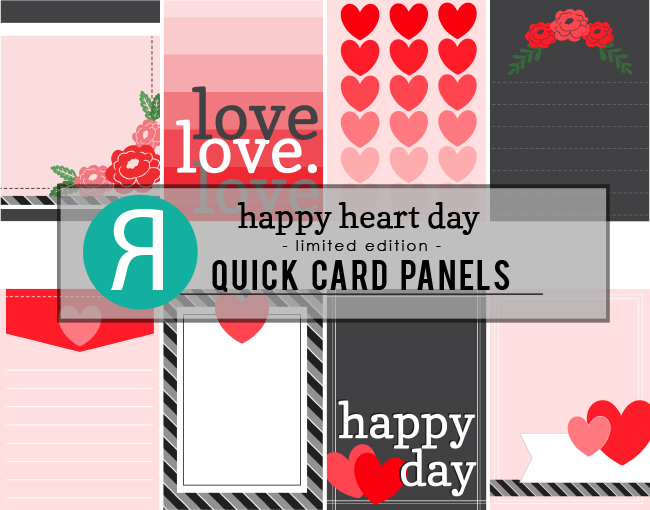 The love card using Quick Card Panel is so fabulous! Can't go wrong with hearts! Love the new goodies. such cute puppy cards. Love the hearts, too! All your projects are amazing!! Love the new dies and stamps! Fantastic job! What an amazing group of projects! Love your striped die panel with those colors and the dogs on top. Great release! Such a great collection of cards Leigh! You included such fun elements on every card! Great work! Such beautiful samples as usual, Leigh! Love how you used the new pretty panel twice to make a long rectangle! Leigh, don't know how you make such gorgeous cards time and time again....All would make recipients happy. Fun and gorgeous! Each one is fabulous... I am Loving that heart love pretty panel!!! Yikes... here I go again! Your cards are all so trendy and pretty! These cards are all so fun and cute! A great selection of new stamps for Valentines. wonderful cards....love how you used the confetti cuts as the background on the first two. Your cards are adorable, love the puppies! Awesome cards!! I really adore your "love" card - fun technique! Wow!! Lots to see! Gorgeous Leigh!! I love the puppies. So fun! The love panel is awesome too. Nice work, Leigh! Wowzers! You totally rocked these! Love them all! Wow...so many beautiful cards. those puppies steal the show. Love your cards, Leigh! 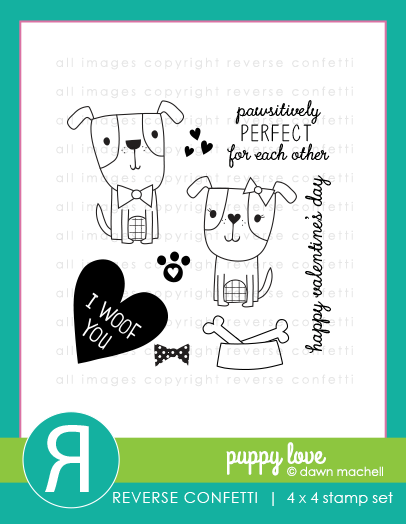 Those pups are adorable and the ombré inking on your last card is awesome! OMG Leigh, these cards are just fantastic! Lovely cards! I couldn't pic a favorite from them if I tried! Puppies and hearts?! Can't go wrong ♥ Thank you for sharing! Love the card with the heart cut-outs. So clever!! Aw, the puppy card is simply adorable! The new release is awesome. It is always to interesting to see how each designer interprets the stamps and dies. Something for everyone! LOVE these sets! Thanks for the chance to win! Love your cards. RC is becoming one of my favorite stamp companies!!! I think Puppy Love is my new favorite! Aww!!! These cards are all awesome! I love the dogs layered on the confetti cuts - such a fantastic effect! 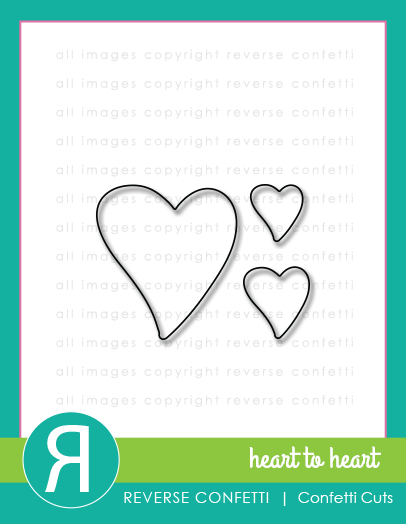 Love the simple elegance of the heart-to-heart card! sweet doggies! love the ombre card! Wonderful cards! Can't pick a fave! So gorgeous! Your pooches are PAWSITIVELY ADORABLE, LOVE the red & aqua combo too!!! LOVE the use of the Chevrons and the way you did the hearts! Brilliant!! Leigh, I've loved all your RC projects lately. I especially love how you used the dies on these cards. So many fabulous ideas!